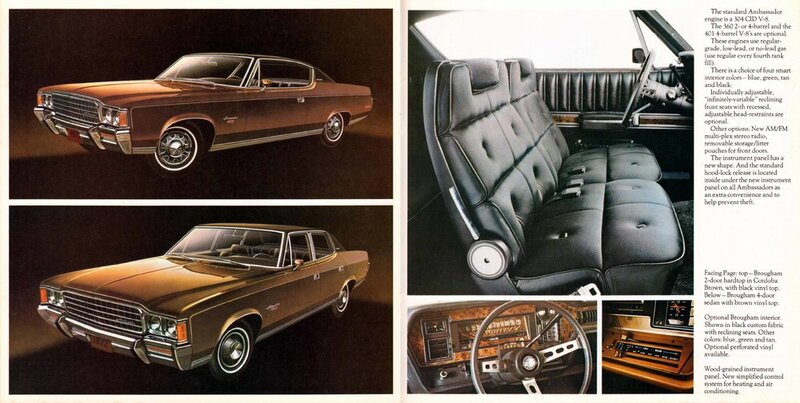 I recently came upon the 1972 American Motors catalog. My first thought was, "how many typographic widows can one publication have?" Then I saw the page with the Javelin interior and thought, "how do I get an eight-track player and that cool handle for the gear shift?" Granted this catalog paints a picture of an alien world or alternate dimension where auto buyers don't all demand bland interiors and equally dull silhouettes. But what an amazing world. Your car was like your living room. You could fit 20 people on the front seat. There was plush upholstery with bizarre patterns, exterior colors that said, "I'm wacky, but wild," and shapes that stopped people on the street. I had a friend whose family owned an Ambassador wagon in avocado green (not the Bradys). They never put the seats up, but left them down creating a flat dance floor environment. It wasn't uncommon to pile 10 kids in the back and let us slam back and forth with no seat-belts. Fun times. And what about that Gremlin? WTF? It must be the ugliest car ever designed. What was the thinking? Why name it after a mythical creature responsible for the sabotage and subsequent crash of World War II airplanes? That's an odd naming choice that appears to have occurred after a three martini lunch. But it's the caption, "Gremlin 'X' in Wild Plum metallic" that is an incredible string of words that contradict each other.